Congratulations to Dr. Shu Chien, Professor of Bioengineering at our partner program, UCSD's Jacobs School of Engineering. Professor Shu Chien, recipient of the National Medal of Science. President Barack Obama will soon honor University of California, San Diego Bioengineering Professor Shu Chien in a White House ceremony for the seven eminent researchers to receive the National Medal of Science, the highest honor bestowed by the United States government on scientists and engineers. Chien is the only engineer among the seven medalists announced last week. “As someone working at the interface of biology, medicine and engineering, I am greatly honored to receive this award which recognizes that such an interdisciplinary approach is essential to translating fundamental research into medical and industrial applications to benefit humankind,” said Chien. Shu Chien, a professor in the Department of Bioengineering at the UC San Diego Jacobs School of Engineering, is a world leader in the study of how blood flow and pressure affect blood vessels. Chien is a university professor of bioengineering and medicine at UC San Diego and director of the UC San Diego Institute of Engineering in Medicine. An expert on how blood flow and pressure affect vessels, Chien’s research has led to the development of better diagnostic tests and treatments for atherosclerosis, which refers to the hardening of the arteries, and other diseases. Chien joined UC San Diego in 1988 after he was recruited by Y.C. Fung and Benjamin Zweifach, who co-founded the bioengineering program at UC San Diego with Marcos Intaglietta. "I regard recruiting Shu as my greatest contribution to UCSD," said Fung in 2005 when Chien received the Distinguished Lifetime Achievement Award from the Asian American Engineer of the Year Awards Committee. Chien has held the Y.C. 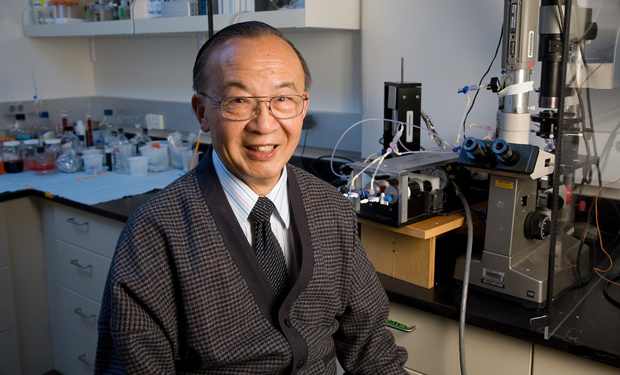 Fung Endowed Chair in Bioengineering since 2006. The Department of Bioengineering at the UC San Diego Jacobs School of Engineering is a leader in systems biology, regenerative medicine and multi-scale bioengineering focused on understanding, diagnosis and treatment of human disease. The UC San Diego Institute of Engineering in Medicine has research centers focusing on health and disease in cardiac, musculoskeletal, retina, and neurological systems; on medical devices and instrumentation technologies; multiscale imaging in living systems; and nano-medicine and nano-engineering. The institute also fosters student training, industry cooperation and entrepreneurism. Chien is widely known as an exceptional researcher, instructor, mentor, and citizen of the university and his professional community. His research integrates biomedical sciences and engineering across the biological hierarchy, from genes and molecules to cells and tissues to organs and systems. Some of his more recent research has focused on the effects of mechanical forces – pressure and flow – on cellular functions such as gene expression. When genes change their expression, the proteins will change, and proteins are the major determinants of cell functions such as growth, migration and programmed cell death. His research has shown how the mechanical forces generated by circulating blood affect the functions of endothelial cells in health and disease. Endothelial cells line the interior surface of the body’s blood vessels throughout the circulatory system. Chien’s research could explain why atherosclerotic lesions form preferentially at branches of coronary arteries. More specifically, this research uncovered the mechanical and molecular mechanism of the preferential distribution of atherosclerosis in regions of complex flow such as arterial branch points by establishing the differential signal processing and gene expression of endothelial cells in these regions as compared to regions resistant to atherogenesis, which is the process by which plaque forms in the arteries. These studies are being performed in collaboration with Julie Li and Shankar Subramaniam, professor and chair, from the Department of Bioengineering at UC San Diego, professors Juan Lasheras and Juan Carlos del Alamo from the Department of Mechanical and Aerospace Engineering at UC San Diego, John Shyy from UC Riverside, Peter Wang from the Univ. of Illinois Urbana-Champaign and others in the United States, China and Taiwan. Chien has worked with Karl Willert, director of UCSD’s stem cell core facility, and postgraduate researcher David Brafman, to develop an automated, computerized process that allows scientists to identify the best environments to grow stem cells. The experiments require mixing six proteins in a wide range of combinations. The machine developed by Chien’s team allows researchers to test hundreds of them at once. With UC San Diego bioengineering professor Shyni Varghese, these techniques are being extended to the screening of synthetic polymers for the optimal growth and development of stem cells. With UC San Diego bioengineering professor Adam Engler and material science professor Shungho Jin, Chien has examined how the physical and geometrical properties of the environments where stem cells grow can influence their development. Chien was born in Beijing, grew up in Shanghai and was a premed student at National Peking University when he and his family went in 1949 to Taiwan during the turmoil of the Communist takeover of China. He received his medical degree from National Taiwan University and a Ph.D. in Physiology from Columbia University, where he served as professor from 1969 to 1988. During a sabbatical from 1987 to 1988, Chien founded Taiwan’s Institute of Biomedical Sciences in Academia Sinica. Chien is a Fellow of the American Academy of Arts and Sciences and has published more than 500 archival journal articles and 11 books. He has served in leadership positions in the Federation of American Societies for Experimental Biology (FASEB), the American Institute for Medical and Biological Engineering (AIMBE), as well as other professional societies. Nominees are selected by a committee of Presidential appointees based on their extraordinary knowledge in and contributions to chemistry, engineering, computing, mathematics, and the biological, behavioral/social, and physical sciences. National Medal of Science awardees with current faculty affiliations with UC San Diego: Margaret Burbidge, Shu Chien, Chancellor Marye Anne Fox, Michael H. Freedman, Yuan-Cheng Fung, Craig Venter, Andrew Viterbi and Walter Munk. Past UC San Diego National Medal of Science recipients include Roger Guillemin, Charles Keeling, George Palade, Linus Carl Pauling, Roger Revelle, Marshall Rosenbluth and Harold Urey. Watch a video about Chien's work and research.